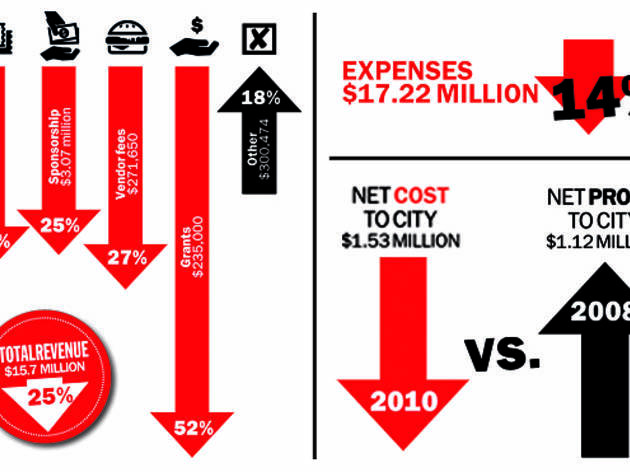 These stats prove that revenue from city’s lakefront fests have dipped sharply since 2008. Taste of Chicago and the other lakefront fests (Viva Chicago!, Chicago Country Music Festival, Celtic Fest Chicago, Chicago Gospel Music Festival, Blues Festival and Jazz Festival) have seen a sharp decline in revenue since 2008, and the city has not been able to cut costs fast enough to keep up. The result? Taste is running at barely break-even, and fests are costing more. 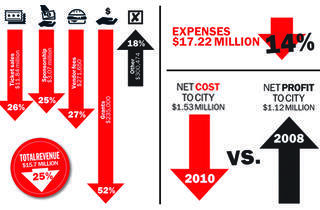 Here are the combined revenue and costs for Taste and the other lakefront fests in 2010, and the change since 2008.